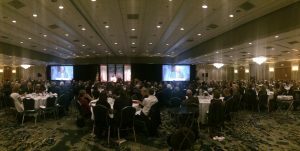 Every year, nearly 500 guests from around the Bay State join together at MFI’s Annual Fundraising Banquet to hear from a dynamic speaker and to celebrate our nation’s traditional family values. With so many supporters gathered at one event, we believe this evening is an excellent opportunity for local small businesses, services or ministries to connect with like-minded individuals in their community! Featuring your business or organization in this year’s program is especially appropriate given our keynote speaker, Michelle Malkin. In addition to being a conservative columnist, commentator and Internet entrepreneur, Michelle Malkin is also a #1 New York Times bestselling author of Who Built That, Awe-inspiring Stories of American Tinkerpreneurs. Written in 2015, she dedicated the book to Barack Obama, who famously said, “…you didn’t build that. Somebody else made that happen.” She writes that he “inspired me to rise up and tell these unsung stories of American individualism, exceptionalism and entrepreneurship.” And she has a real knack for telling fascinating, little-known stories of inventors who have contributed so much to American progress. If you own a small business, provide a service or would like to share information about your church, ministry or private school, we are opening up the opportunity for you to be featured in our banquet program through a corporate sponsorship. You can view last year’s banquet program here to see examples of our previous sponsors. Malkin calls them America’s “tinkerpreneurs”— innovators who developed “little” ideas to create products, companies, wealth, opportunities and conveniences that we take for granted today. She tells inspiring stories of dedication and hard work, describing the development of products from flashlights to bottle caps and bridge cables to toilet paper. These “tinkerpreneurs” were dogged in their pursuit of an idea, self-motivated and mostly self-funded. She articulates an unwavering belief in America and enthuses about the American spirit that is based on the inherent values of faith, freedom and family that is still operative today. And as a champion of this uniquely American exceptionalism, she encourages us all to reflect on how ordinary people can do great things. We hope that you are inspired by Michelle and will choose to grow your network with us! In addition, this year we’re offering a special 25% off discount for first time sponsors. If you are interested in sponsoring this year’s banquet featuring Michelle Malkin, please email our Director of Communications Lena Ready at lena@mafamily.org for more details on sponsorship level options, or contact our main office at 781.569.0400.